The quest to win the premier cup competition in women’s rugby league has reached the semi-final stage with two of the biggest names in the sport going head-to-head. Leeds Rhinos Women will meet their counterparts from Wigan Warriors on July 15 while Catsleford Tigers Women meet York City Knights in an all-Yorkshire semi-final. The final will be played at the Halliwell Jones Stadium in Warrington on August 4. Leeds reached the last four with a 46-10 victory over the Army Ladies last Sunday. Dannielle Anderson scored an early brace to put the Rhinos in a dominant position, only for Army to come back with tries from Toni Tomkins and Matilda Butler. Any hopes of an upset were quashed in the second half as Caitlin Beevers ran in a hat-trick in the final 20 minutes. Leeds captain Lois Forsell said: “It was a physical game which was closely contested in the first half. We came out in the second looking to improve the intensity and quality of our skills which we did and that allowed us to get more points on the board. Castleford Tigers booked their place in the semi-finals with a 30-16 victory over St. Helens. The Tigresses advanced to meet York in the last four; a side they beat 62-0 earlier this season. Tries from Kelsey Gentles and Tara Stanley helped Castleford to a 12-4 half-time lead in the quarter-final win over Saints. Saints responded in the second half with tries from Leah Burke and Lizzie Gladman but ultimately, the visitors were unable to stop a rampant Castleford side. 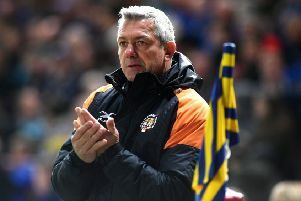 Castleford head coach Lindsay Anfield said: “I’m really pleased with the win. The girls have worked hard in training and despite a few injuries we managed to pull through. Wigan Warriors progressed thanks to a 44-18 win against Featherstone Rovers at the LD Nutrition Stadium. The other semi-final also saw an abundance of tries as York dispatched Barrow 62-6.